Jered Weaver is having an excellent season. Only two starts removed from his no-hitter, he had allowed no earned runs in four of his first seven starts this spring. But then came Sunday night and the Texas Rangers and their heavy machinery. 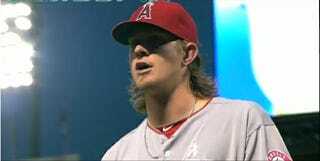 Weaver managed to strike out Josh Hamilton twice, but he also gave up eight earned runs and had to be yanked after getting just one out in the fourth inning. It was one of those evenings. There was nothing left but to sing along.